The complexity of your garage door system makes regular maintenance a requirement. Without it, the accumulation of gradual wear and tear will result in all sorts of problems, and will greatly reduce the lifespan of the system. Our technicians can make sure that your door stays in great shape for a very long time. The components in charge of supporting and counterbalancing the weight of your garage door panels need to be carefully checked on a regular basis, in order to ensure that they aren't about to snap. A broken spring will make the door inoperable, and can damage other parts of the system as a result. Not to mention, failure with these components can lead to serious physical injuries. Our team will make sure the coils of your springs aren't getting deformed, then lubricate them properly, and adjust their tension in order to make sure the door stays balanced and even. The opener is the brain of the entire operation; and just like the human brain, it relies on other "organs" in order to assess various situations and react appropriately. The photoelectric eyes that this device uses to detect obstacles must be properly positioned; otherwise, they could fail to serve their purpose, which is a major safety concern. Our technicians will inspect their alignment, readjust their position as necessary, and even replace them if their lenses are too scratched or have become otherwise damaged. Both of these components require some TLC in order to stay in a functional state. 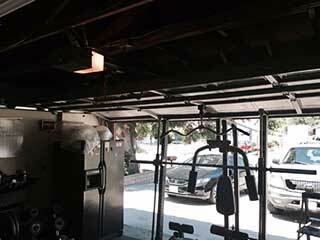 Bent tracks and worn rollers are some of the most common issues that can plague an overhead door. They can cause all sorts of problems, like a door that gets stuck, or gets off track and nearly collapses. That's why we make them one of the different priorities of our garage door maintenance service. We'll straighten any bends, replace damaged rollers and make sure the door can move smoothly and without any issues. It's better to prevent issues from developing than to deal with them once they've manifested fully. Let our team at Garage Door Repair Brushy Creek take care of the various problems that are threatening to bring your daily routine to a screeching halt. Contact us today to schedule an appointment.